Are you using a smartphone or tablet with Intel chipset? If yes are you looking for an easy way to flash stock firmware in your device? If yes is your answer again then you are in the right page. Download Intel Phone Flash Tool, install it in your computer and use it for flashing stock ROM firmware in your Intel based device. Intel Phone Flash Tool allows you to flash stock firmware on devices running on Intel Chipsets including smartphone and tablets. 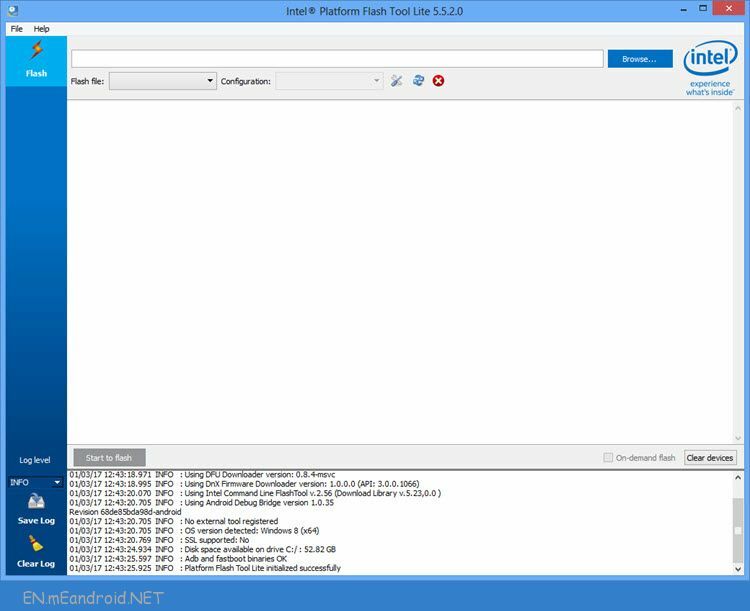 Here, on this page, we have managed to share all versions of Intel Phone Flash Tool including the latest one. Here you can download all versions of Intel Phone Flash Tool for Windows, Linux and Mac. 1) Simple UI: The user interface of this flash tool is extremely simple. Even if you are newbie to Android development, you can use this tool to flash firmware in your device without hassle. All you have to do is load the stock ROM in this tool and click on “Start to flash” to flash firmware in your device. 2) Supports All Devices With Intel Chipset: Using this flash tool, you can flash stock Android firmware on all smartphones and tablets with Intel chipset. 3) DFU Tool: The Intel Phone Flash Tool comes with an inbuilt DFU Tool that lets you to flash stock firmware on devices with Broadcom chipset. If you are using a Broadcom based smartphone or tablet, you can use this flash tool for flashing Android firmware. 4) USB Drivers: When you install the latest version of Intel flash tool, it will automatically install all the required Intel USB drivers. So there is absolutely no need to download Intel USB drivers and install it in your computer. 1) The Intel flash tool is compatible with all versions of Windows i.e., Windows 10, Windows 8.1, Windows 8, Windows 7, Windows Vista and Windows XP. It is also available for Mac and Linux operating system as well. 2) The Intel Phone Flash tool is developed by Intel Corporation. So, all credits must go to them. Also, if you face any errors while installing or using this software, contact their support team. Compatible With: This tool supports Windows XP (32 Bit), Windows Vista (32/64 bits), Windows 7 (32/64 bits), windows 8, 8.1 (32/64 bits) and Windows 10 (32/64 bits). It is also available for Mac (OS X 10.9, OS X 10.10) and Linux (12.04 LTS 64 bits) Computers. How to Use: If you want to learn how to use Phone Flash Tool to Flash Firmware then head over to the How to use Intel Flash Tool to flash firmware. Download Intel USB Driver: If you want to download the official usb driver then head over to the Intel USB Driver to download the latest driver. Credits: Intel Flash Tool is created and distributed by Intel Inc. So, full credits goes to them for sharing the tool for free.